Greetings again from the darkness. While there is a massive target audience for Steven Spielberg’s return to fantasy adventure filmmaking, I am most certainly not part of that esteemed group. 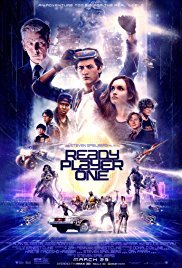 Although I very much enjoy throwbacks and tributes, I haven’t touched a video game controller in 3 decades, and of course have not read Ernest Cline’s popular novel – the source material that inspired Mr. Spielberg to veer from his recent heavy dramas (the exception being THE BFG). Still, being a movie lover, I couldn’t help but be intrigued by the project. Seemingly a match made in Virtual Reality heaven, we get one of the premier fantasy filmmakers joining forces with a screenwriter (Zak Penn) who has had success with comic book adaptions, and a bestselling first novel from a geeky author. Fascinating to watch, the film plays like Mr. Spielberg’s $175 million personal toy box. There is a story, though one could argue it exists solely for the purpose of pushing the visual FX envelope. A Steve Jobs-type guru named Halliday (Mark Rylance) designed a 3-part contest of skill and strategy with the grand prize being full control over OASIS – a virtual world that allows the players to be anyone or anything they desire. Since Halliday’s death, most people in this dystopian future of the year 2045 spend their waking hours immersed in OASIS. Some use it as an escape from their bleak lives, while others are attempting to solve the mysteries of the 3 keys. Set in Columbus, Ohio, which we are informed is the fastest growing city in the world (why?? ), there are two factions vying for the grand prize: true gamers/gunters and megacorporation IOI being run by corporate villain Sorrento (Ben Mendelsohn). Tye Sheridan (MUD) stars as Wade Watts, whose avatar is Parzival, one of the more thoughtful characters. Olivia Cooke (THOROUGHBREDS) plays Ar3mis, a rebel gunter (egg hunter) out more for revenge than victory. They are part of a group of misfits who label themselves ‘High-Five’, even though Parzival gets left hanging every time. Near non-stop action and relentless pacing result in a whirlwind of lights and colors and visuals that are mixed with more 1980’s pop culture references than anyone could possibly catch in one viewing. As a primer, you should brace yourself for a key role from THE IRON GIANT (1999), as well as various appearances and nods to TRON, BACK TO THE FUTURE, Freddie Krueger, Chucky from CHILD’S PLAY, the Holy hand grenade (Monty Python), the infamous Big Foot monster truck, a speeding DeLorean, the 1960’s era Batmobile, that hideous A-Team van, Christine from CHRISTINE (1983), John Hughes, King Kong, BEETLEJUICE, and a personal favorite, Buckaroo Bonzai. It’s also a kick to see the Rubik renamed Zemeckis Cube. The most stunning sequence for this old geezer was the virtual recreation of Stanley Kubrick’s THE SHINING (1980), especially the focus on Room 237. It’s these kind of nostalgic injections that prevent it from coming across as an overblown CGI spectacle with VR goggles. Others in the cast (more time as voices than real people) include Lena Waithe (“Master of None”), TJ Miller as a bounty hunter with some of the film’s best one-liners, Simon Pegg as Halliday’s former business partner, and Phillip Zhao as Sho. Surely you’ve figured out that this one isn’t about the cast. OASIS is where your imagination rules and Easter eggs are driving plot lines. Alan Silvestri takes over the music from usual Spielberg collaborator John Williams, and delivers one of my favorite references (and one of the oldest) in the film – WILLY WONKA AND THE CHOCOLATE FACTORY (1971). Cinematographer Janusz Kaminski must have been exhausted by the time filming was complete, though we can’t always tell what was filmed and what was created in the lab. Spielberg is a master manipulator when it comes to nostalgia, though we can’t help but wonder if he is making a statement with this being the next evolution as our society becomes ever-more-involved with their phones and personal devices. At least maybe some kid will leave this film with a greater appreciation of research. Greetings again from the darkness. Writer/director Jeff Nichols’ follow-up to his very strong Take Shelter is a grounded, rustic look at what it means to become a man. While that may be enough, it also works as a chase movie, a buddy movie, a family drama, and a look at small town dynamics … all seen through the eyes of 14 year old Ellis (Tye Sheridan from The Tree of Life). Matthew McConaughey stars as Mud, a drifter who quickly captures the fascination of Ellis and his earnest buddy Neckbone (newcomer Jacob Lofland) as their worlds collide under a boat in a tree just off the Mississippi River in rural Arkansas. Turns out Mud is a bit of a smooth-talking philosopher who wins Ellis over spinning life yarns that come just as Ellis’ parents (Ray McKinnon from O’ Brother, Where Art Thou?, and Sarah Paulson from Martha Marcy May Marlene) are hitting a rough patch and he is trying to figure out just how the female species fits into the whole big picture. Mud lays out a beautiful story of how he killed a man protecting his true love Juniper (Reese Witherspoon). Now Mud is being chased by the man’s family (brother Carver played by Paul Sparks, and father King played by the too-rarely seen Joe Don Baker – looking great at age 77). Michael Shannon has a few scenes as Neckbone’s Uncle who makes a living by diving for mussels in the river. You might remember how terrific Shannon was in Nichols’ Take Shelter, and he has become quite an interesting and dependable character actor in various projects. Even more impressive is Sam Shepard as Tom Blankenship … the father figure for Mud, and a quiet river guy with quite a colorful past. Shepherd’s first scene with Ellis is brilliant and could generate a campaign for Best Supporting Actor if this film can reach a wide enough audience. The story is filled with numerous little realistic touches and it’s so original that there is no perfect comparison … though it does have some of the feel of Stand By Me, which is quite a compliment. It is difficult to remember another film where Beanie Weenies were such a valued prop, or where a boat in a tree became a negotiating point, or where the unhurried pace led to such tension. Tye Sheridan delivers a strong and rare performance for such a youngster, and McConaughey deserves special mention because he has clearly broken free of his early career Him-Bo roles, and can now be considered a legitimate actor. He is simply outstanding in the role of Mud. We sense the danger that follows him, but are enchanted with his connection to the boys. David Wingo’s score is the perfect cap for this little gem. Greetings again from the darkness. Rare are the times that I find myself lacking words to express my opinion on a movie just watched. But writer/director Terrence Malick does not play fair. First of all, what director makes only five films in 40 years? Who makes a film about CREATION, life, evolution, spirituality, death and existence? What director seems to thrive when no real story is needed to make his points? Which director can so mess with the viewer’s head through visual artistry never before seen on screen? The answer to these questions, of course, is Terrence Malick. And I hold him responsible the fact that I remain in somewhat of a semi-conscious fog four days after watching his latest masterpiece. Any attempt to explain this film would be futile. It is so ripe for interpretation and quite a personal, intimate journey for any viewer who will open themselves up to the experience. What I can tell you is that much of the film is focused on a typical family living in small town rural Texas in the early 1950’s. Brad Pitt plays Mr. O’Brien, the stern disciplinarian father and husband to Jessica Chastain‘s much softer Mrs. O’Brien. Near the beginning of the film, we get Mrs. O’Brien as narrator explaining that when she was a child, the nuns informed that in life one must choose between Nature and Grace. Nature being the real time of real life, whereas Grace is the more spiritual approach. Clearly, Mr. O’Brien has chosen Nature, while his wife embodies Grace. Watching their three boys evolve in this household is quite a cinematical treat – and is done with so little dialogue, it’s almost shocking to the senses. One of the many things that jumped out at me was the set and production design of Jack Fisk. Mr. Fisk is a frequent collaborator with Mr. Malick and is also the husband of Sissy Spacek, who starred in Malick’s first knockout film Badlands. Unlike many films, I did not have the feeling I was watching a movie about the 50’s. Instead, the look is directly IN the 50’s … slamming screen doors, tree houses, and family supper time! But don’t think for a moment that this is a story about the O’Brien’s and their sons. This family is merely Malick’s vessel for showing the earthly connections between the universe and each of the particles within. If you think this sounds a bit pretentious, you should know that Mr. Malick graduated from Harvard with a philosophy degree, became a Rhodes Scholar at Oxford, and a professor at MIT. This is a thinking man and an artist. Actually I would describe the experience as viewing an art exhibit and listening to poetry. Even the use of Smetana’s The Moldau River is an example of music melding into film. It really sweeps over and through you, and takes you on a trip of introspection. So many human emotions are touched – the need to be loved, appreciated and respected. We see the oldest O’Brien son later in life. Sean Penn plays him as a very successful middle aged adult who still struggles with the death of a brother and communication skills learned from his childhood. This is an odd sequence but provided to give balance to the flurry of emotions the younger boy survives. This was the 2011 Cannes Film Festival Palm d’Or winner and that means little if you don’t let go as you walk into the theatre. It’s a contemplative journey that you can either take part in or fight. My advice is to open up and let this beautiful impression of all life take your mind places it may have never been before. SEE THIS MOVIE IF: you are ready and willing for an emotional and intellectual and spiritual journey that will have you contemplating life for many days after you leave the theatre. SKIP THIS MOVIE IF: you found The Hangover Part II to be too heavily intellectualized for your movie tastes.